At this year’s Two Sessions, tech industry leaders such as Pony Ma from Tencent and Lei Jun from Xiaomi expressed optimism about 5G empowering sectors such as industrial Internet of Things (IoT), new media, smart agriculture, autonomous vehicles and healthcare. But just how far are we from realizing 5G’s full potential? Yvonne Yu, CEO of Politech, seeks to demystify 5G by providing a brief but comprehensive overview of its development in China. Allocating 5G spectrum (frequency bands) to telecom carriers. Different companies use different parts of the spectrum to transmit 5G data. Using one part over another impacts both the speed of the connection and the distance it can cover. Without first knowing which 5G spectrums are allocated, telecom carriers cannot build 5G network infrastructure, and manufacturers cannot produce 5G phones. With 5G spectrum allocated, telecom carriers are able to build the network infrastructure in accordance with standards set by 3GPP, the key standardisation body for global mobile communication systems. Telecom carriers will purchase equipment, such as 5G core network and base stations, developed by network equipment suppliers like Huawei. With the right network infrastructure, data can be transmitted at a faster speed and lower latency. To realise commercialisation however, there’s one last missing piece- terminals. The most common are 5G smartphones, autonomous vehicles, smart watches and 5G virtual reality/augmented reality (VR/AR) headsets. On 6th December 2018, the Ministry of Industry and Information Technology issued China Telecom and China Unicom licences for the 3.5 GHz band of the global standard, and China Mobile the suboptimal 2.6GHz and 4.9GHz bands. This puts China Mobile at a disadvantage, as network equipment and commercial 5G products will need to be modified to receive signals from the different bandwidth. An upside for China Mobile is that the 2.6GHz band was used in the 4G era, so it can reuse some of its current network infrastructure. With government support and equipment provided by Huawei and ZTE, the three telecom carriers are piloting 5G in 26 cities (see map), aiming for 500-1,000 base stations in each city per carrier in 2019. This will enable subways, entertainment spaces, sports halls and commercial buildings to be covered by 5G. 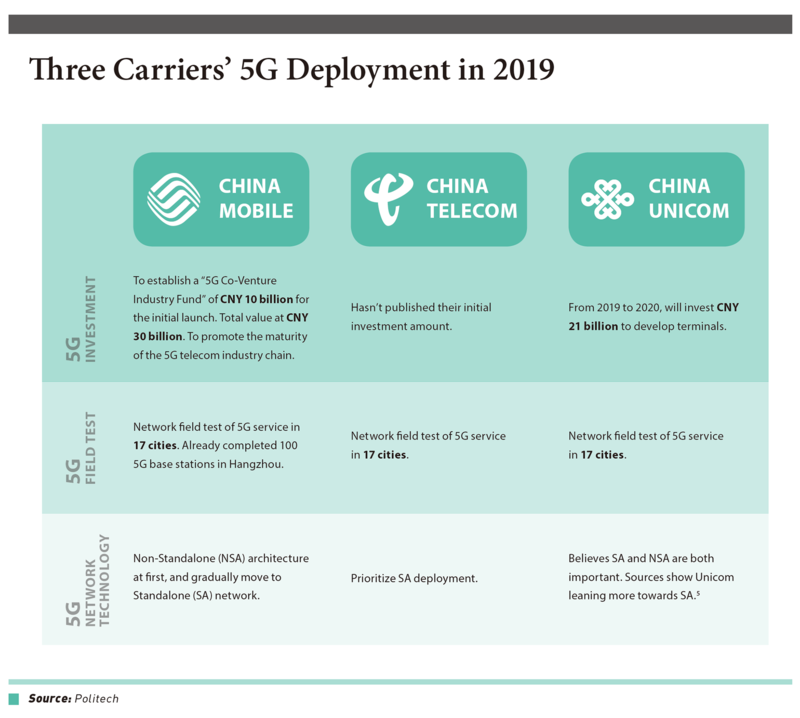 Further, the three carriers are devoted to investing tens of billions in 5G deployment in 2019 as shown in the table. Though China’s plan to build 5G infrastructure is very impressive, full nationwide coverage is not possible till at least late 2020. Terminals are smart devices able to receive 5G signals, such as phones, cars and watches. 5G smart phones are by far the most developed terminal. Phone manufacturers from around the world showcased their 5G phone prototypes at the Mobile World Congress in Barcelona in February. They included Huawei’s Mate X—a foldable phone that runs on Huawei’s self-developed 5G chipset, the Balong 5000—and ZTE’s Axon 10 Pro 5G, both expected to enter the market by mid-2019. Though phone manufacturers are eager to launch their 5G product, the unavailability of the 5G network, high pricing of the phones, and a lack of killer applications will continue to hinder their mass adoption. 5G’s commercialisation is aimed at more than just boosting speeds for consumers and selling handsets. 5G is about creating a network optimised for connecting billions of new devices to the Internet. 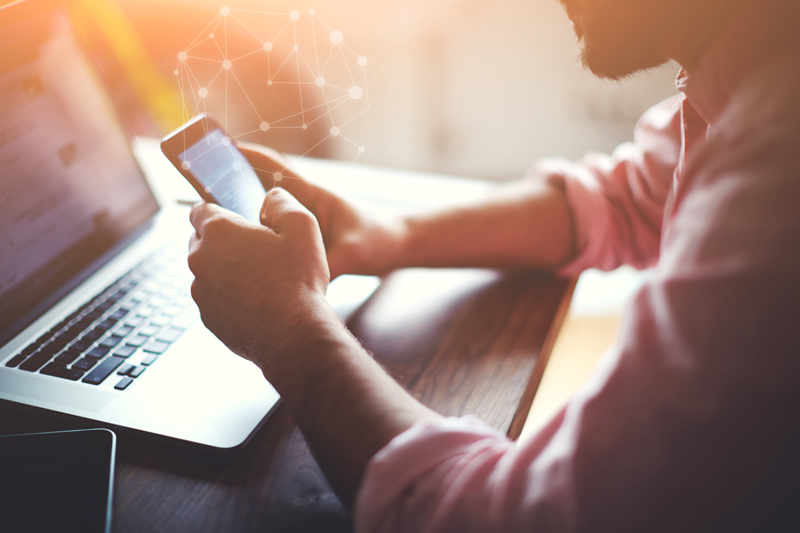 This requires the support of different sectors, and presents a unique business-to-business (B2B) opportunity to telecom carriers, alongside the traditional business-to-consumer (B2C) model. So far, telecom carriers are able to deploy 5G network coverage at a few key facilities, including Tiananmen and the Palace Museum in Beijing, the Canton Tower in Guangzhou, Lukou International Airport in Nanjing and Hongqiao Railway Station in Shanghai. The goal in 2019 is to expand 5G coverage in the 26 cities identified on the map. For example, China Mobile plans to cover Beijing (within the 5th Ring Road) by the end of 2019. It will also build “thousands” of base stations in Shanghai by May 2019. It is expected that commercial 5G will roll out in major cities by the end of 2019. New Media: 5G was used for ultra-high definition video transmissions from this year’s Two Sessions. Healthcare: on 16th March 2019, China conducted the first 5G-based long-distance human surgery to successfully complete a “brain pacemaker” implantation for Parkinson’s disease. A neurosurgeon in Hainan used China Mobile’s 5G network to receive high definition video images in real time and operate surgical instruments remotely. Industrial IoT: China Unicom is to provide a 5G smart harbour system at the Port of Qingdao, Shandong. Autonomous vehicle: test drives in Wuhan, Changsha, Chongqing, Beijing, Xiong’an, Ji’nan, Shanghai and Xiamen by telecom carriers. The National Development and Reform Commission (NDRC), the top policy planning body, also promised to speed up the process of issuing licenses for commercial use of 5G technologies in 2019. It is unclear yet which sectors will benefit the most from 5G. What is clear though, is that the various pilots and trials happening in 2019 will certainly lay the groundwork for mature B2B use of 5G scenarios in late 2020. Politech (透策科技) is a boutique strategic consulting firm serving foreign companies and local governments in China. Officially established in 2018, Politech is incubated by the University of Tsinghua and Innoway, a prestige state-owned enterprise. Politech’s investors include industrial IoT leader ProudSmart, and ex-CTO of IT Juzi. It has developed its own proprietary database with 80 million-plus company data, and is currently serving two Chinese local governments. 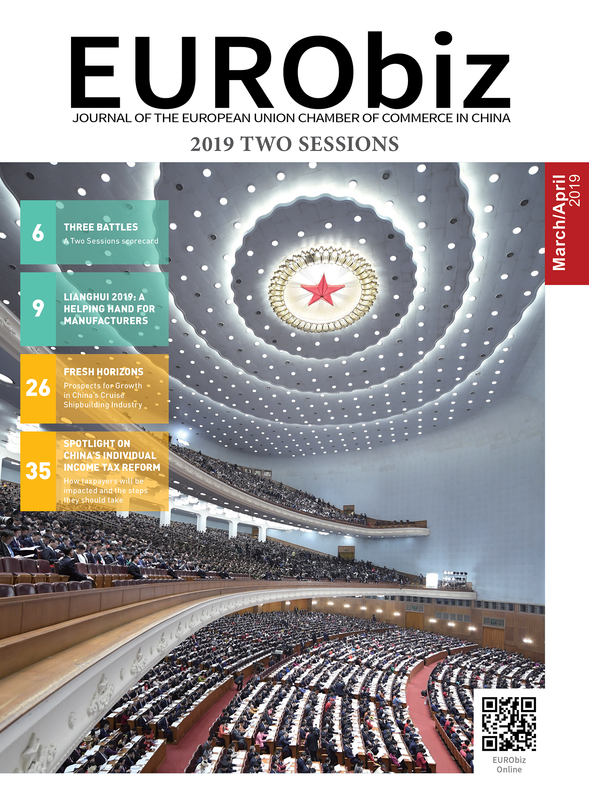 Share the post "The Broader Spectrum: China’s Path Towards 5G Commercialisation"